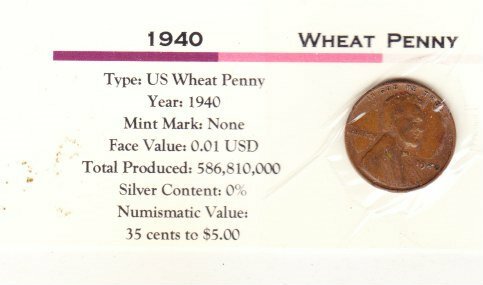 1940 Wheat Cent , Copper Penny , Circulated United States Currency. Denver Mint. Very Good is VG-45 on the Sheldon scale. The entire design is overall good, details are visible and prominent. Full rims are nearly always a requirement for this grade. A full rim means that you can see a line around the edge of the coin where it was raised up. Penny is mounted on a card with all the information about circulation, composition, designer. Price includes shipping to all US residents inside USA, all others may email for exact cost of shipping.